In the Voer-region the same undulating landscape can be found as in the Dutch ”Mergelland” or Limestone country of southern Limburg. Some 100 million years ago water of a shallow tropical sea inundated this area. Thus the Voer region overlies a limestone bedrock. In the sea, rich in nutrition, there was an abundance of so-called ”foraminiferes”, tiny creatures with an outward skeleton of lime or chalk. It was these lime skeletons that formed the metres and metres of limestone which are now to be found in the soil of both southern Limburg “Limestone country” and the Voer region. During the Pleistocene epoch – the ”glaciations” of which the last one ended some 10 000 years ago – the area was raised by the formation of the Alps. The river Meuse and other small streams such as Voer and Gulp could gradually embed themselves in the slowly rising plain. The various terraces, valleys, terrace edges and dry dales are still easily discernible in the landscape. During these glaciations, periods with a much colder climate than we have nowadays, much more water flowed through these rivers. This explains the enormously wide valleys as compared to the relatively narrow waterbeds, or even dry dales where no water flows any more. The Meuse and Voer valleys were to a certain extent cultivated from the Roman fortress of Maastricht and surrounding villas (agricultural farms) in the first centuries A.D.. The area was subsequently conquered by Franconian tribes from the Rhineland and a mighty kingdom flourished under Charlemagne. 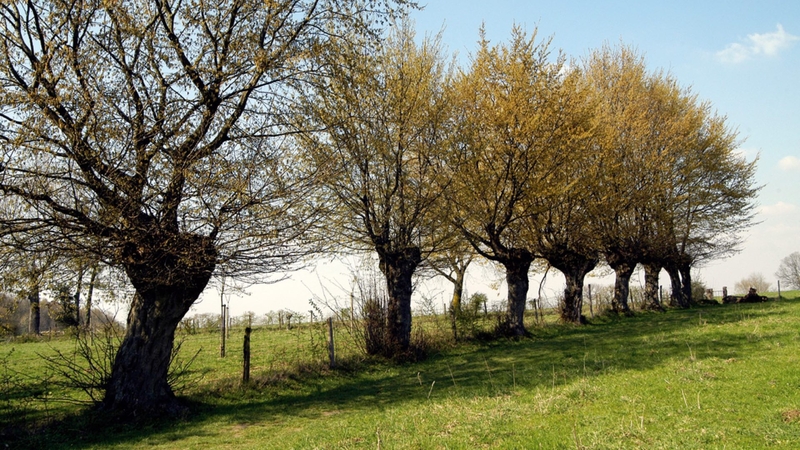 Around 1100 the extensive wild woodland on the plain to the east of the Meuse valley was exploited and cultivated from small but rich territories in the Meuse valley which belonged to this Carolingian empire with first ‘s-Gravenvoeren and later Dalhem as its centre. 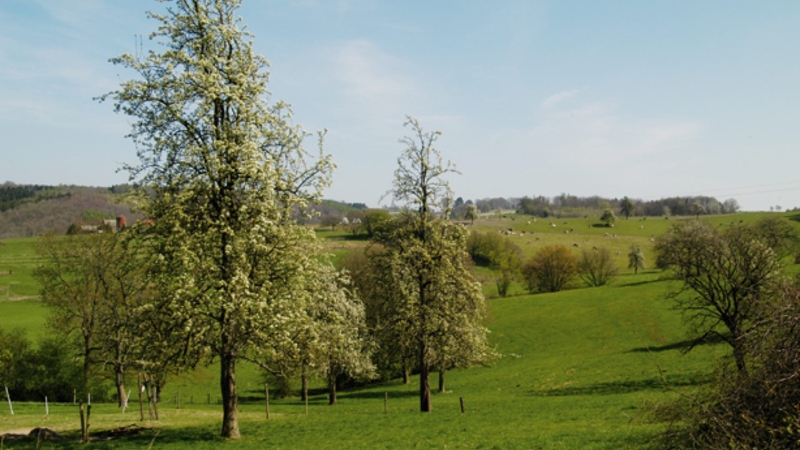 The landscape so typical of both southern Limburg and the Voer area acquired its present shape in a period of hardly 200 years, after only a few generations of hard labour. After 1300 not much has fundamentally changed from a landscape point of view. The deep so-called dry valleys formed the natural access routes along which the plains were reached. Small settlements, which at first had strong ties with the founding villages, formed the centres which grew into the present villages and farm hamlets on the plateau. 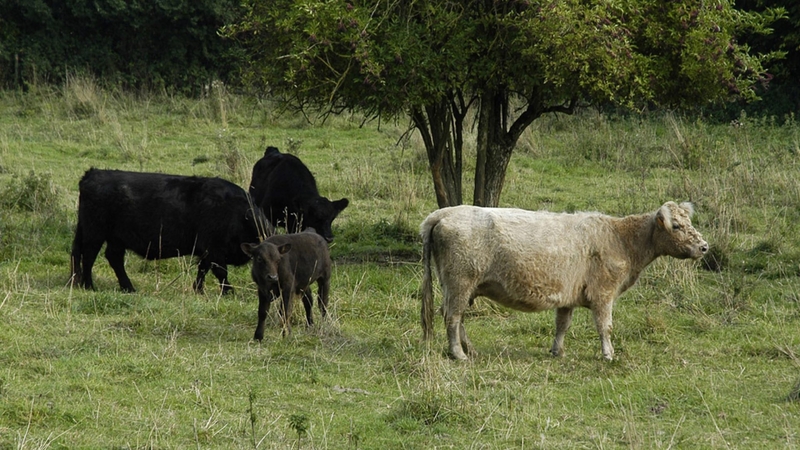 Due to climatic differences with the rest of Flanders and the Netherlands we find plants and animals in the Voer region which do not occur more northernly. Moreover, in many places the soil is very rich in lime. Yet the soil on the slopes is acid and not very fertile. These factors all contribute to the very specific fauna and flora in the Voer region. On the steep, southern slopes we find rich and varied natural beauty. In some places the oak and birch woods which had developed spontaneously, were replaced by beech, larch and spruce which has stimulated the presence of bracken and honeysuckle. Typical of this type of continental wood are the common medlar and the elderberry which we find in abundance. Lower down on the slopes it is especially oak and hornbeam that we see with a lot of common ash and wild cherry in which old man’s beard and ivy are rampant. In summer marjory and danewort grow in sunny places, typical ”southerners” which are the ideal environment for the famous ‘escargot de Bourgogne’ or burgundy snail. Keen animal lovers point at a lonely buzzard in the sky or admire a kestrel hovering motionless above its prey. They may be spotted more easily than the shy deer, foxes or badgers. Yet the attentive nature lover may undoubtedly spot traces and tracks of these animals in the woods. This unique piece of natural land in Moelingen was bought in 1996 by the Wood, Green and Nature conservation services of the Flemish Community. 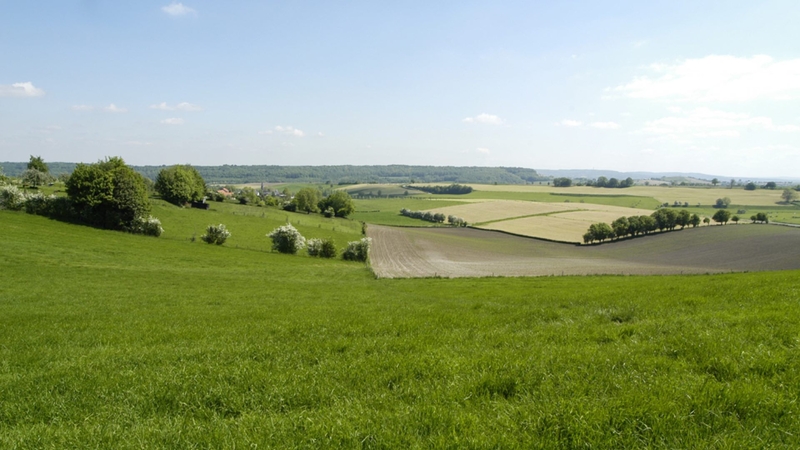 It covers 11 hectares (one hectare is 10,000 square metres) and borders on the classified Langveld (Longchamps, in the nearby Wallonian Berneau), which was also designated as nature preserve. In the valley of the Berwijn the badger feels perfectly at home because he can find all he needs to feed himself and his young. 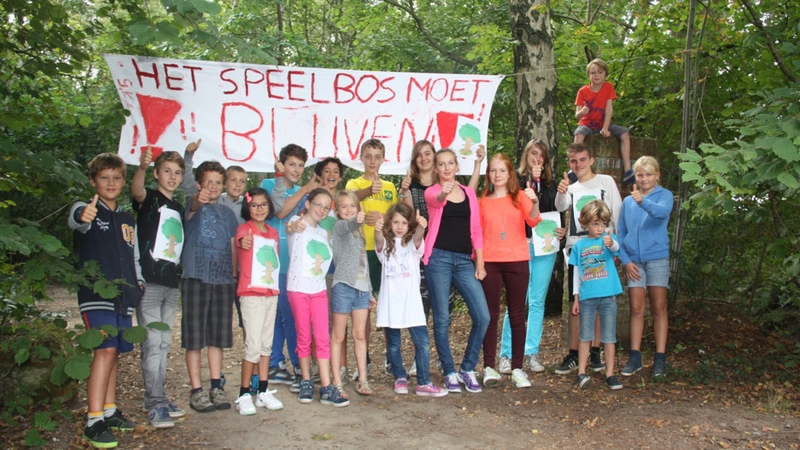 The nature area contains the only two hectares of wood of the district community of Moelingen, with a great variety of indigenous tree species such as cherry, ash, oak, tilia and hornbeam. Then there are some magnificently old orchards and old pollard willows along the banks of the Berwinne. Next to the badger burrows you also find the ideal nesting area for all kinds of birds and waterbirds. purpose. The entire area is fenced in and the entrances are only there for passive leisure (pedestrians). Mountainbiking is allowed – but only via the midddle road in order to cross the area. Horse riders and motor vehicles are forbidden. The Alserbos has a surface of 65 hectares, from north to south, with an altitude of 160 to 240 metres above sea level. The western slope is very steep and starts at the bottom in a deep, hollow road which follows a dry depression or ”delle”; an environment in which, among others, the badger feels at home and where he can has en ideal living and foraging environment at his disposal. It is the present owners’ intention to restore the original character of the western, steep slope. A new oak and birch wood has been planted followed higher on the slope by a variation of oak, tilia, ash, wood cherry and beech. On the plateau itself a nature preserve was delineated where the afforestation can spontaneously take place . It is, by the way, one of the rare sites in the Voer region where heather, broom, carex and wavy hairgrass are rampant. Part of the nature area was opened as “playground wood“. 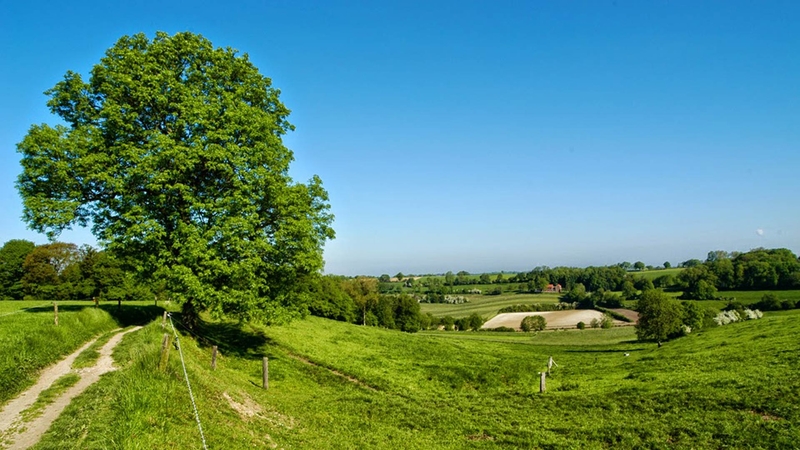 In 1998 the Flemish public authority Aminal bought twenty hectares of nature area close to ‘Dal’, a neighbourhood in the tiny hamlet of Veurs (Sint-Martens-Voeren) known for its concentration of typical timber frame houses. Because of its extraordinary fauna and flora it forms — with its mainly old tall tree orchards, forest edges, pitches and ditches – undoubtedly one of the most beautiful and most important nature ares in the Voer region. It is also one of the main foraging areas for badgers. The new proprietors would like to restore the original natural habitat fully by planting tall (standard) fruit trees, willows and hedges. Gullies are being reforested so that they can harbour badger burrows and minimally two amphibian pools will be constructed. By intensive control of grazing cattle the lime flora must be given a new chance so that, among others, orchids can flourish again. Hawks, red kites, little owls and tawny owls feel well at home here. 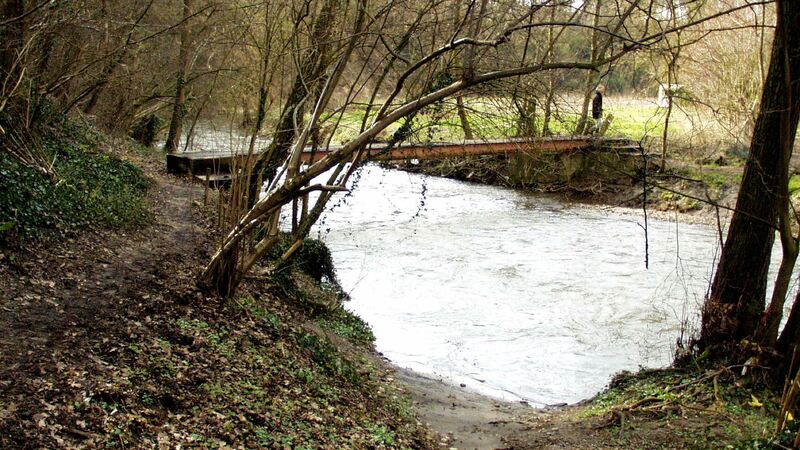 Domain Altenbroek – a nature reserve that is situated across the border between ‘s-Gravenvoeren (Belgium) and Noorbeek (the Netherlands) – owes its name to a splendid private castle domain in the middle of the nature reseve. 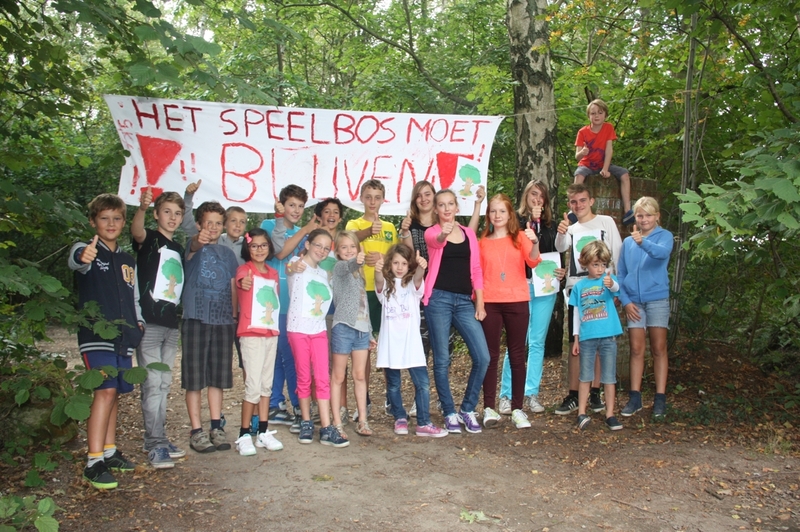 In 1996 the (Flemish) Nature reserves and the (Dutch) foundation Natuurmonumenten became the owners of 160 hectares of Altenbroek: 135 hectares on Belgian and 25 hectares on Dutch ground. The exceptional landscape and natural wealth of the Voer region, and more precisely of Altenbroek, is the result of the eastern location, geographically speaking, the height above the sea level and the curious composition of the soil. The Voer region, moreover, has an outspoken relief. More specifically, the asymmetrical valleys, of which the steep, southern slopes receive much more sunshine than elsewhere. On those steep slopes the Gulp has deposited chalk. The varied landscape also shows the remains of old terraces of the river Meuse (such as the slope of Snauwenberg), grasslands and tall tree orchards with pools, watersprings, gullies, hollow roads, ditches and numerous deciduous woods. The combination of higher temperatures and soil rich in lime has produced a great variety of southern plant species; the Voer region is situated on the crossover between the Atlantic and Middle Europian biotope or plant district. The area owes plant species such as medlar and elderberry to Middle Europe, on the warm, southern slopes varieties such as wild marjory, danewort, field scabious, clinopodium vulgare and fly orchid reach their most northernly location.